Chrysler Witech Micropod II online version hot sale on cnautool.com, some custom order wiTECH micropod 2 from other supplier and stop work, we can offer wiTECH Chrysler diagnostic software installation service make wiTECH micropod 2 restart work. Or order wiTech Micropod 2 from cnautool.com directly. 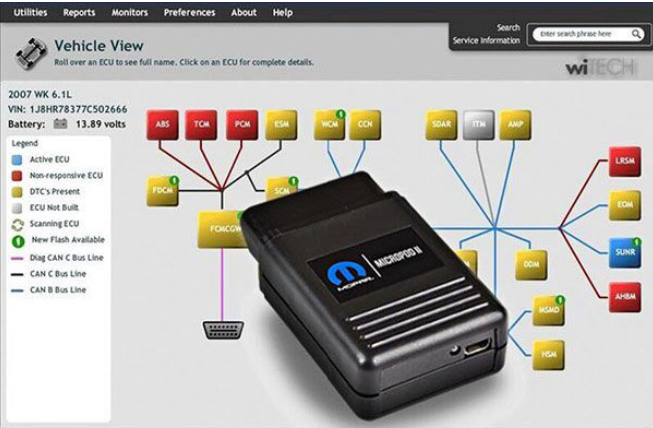 Below cnautotool.com customer share how to use wiTECH Micropod II add new key for 2014 Jeep Wrangler. Situation: My Jeep came with only ONE key and I wanted a second key. You must have Witech 16.05.15 or older installed. Witech 17 gave me errors about requiring Witech 2.0. Step 1) No key in the ignition, plugged in wiTECH Micropod 2 to OBDII port. Step 2) Connected Micropod 2 to laptop via USB cable. Step 3) Opened Witech and it asked me to identify my Jeep and enter my VIN. FAILED at this point. It required internet connection to validate the VIN and asked me to log into Dealer CONNECT or Tech Authority. Step 1) No key in the ignition, plugged in Micropod 2 to OBDII port. Step 2) Put my single good key in the ignition and put it to the RUN position. Step 3) Connected Micropod 2 to laptop via USB cable. Step 4) Opened Witech and left it offline. Step 6) Entered my dealer supplied PIN. Step 7) Removed old key and inserted new key. Step 8) Be happy I now have two working keys to my Jeep.